This day's walk in June 2008 proved to be something of a marathon, largely as a result of my desire to use public transport, something which I feel quite strongly about! The day started by taking the Uig Citylink bus from Tyndrum. When I asked the driver to drop me off near the A82 bridge at the end of Loch Tulla he was very apologetic, as the drivers aren't supposed to drop off passengers except in safe places such as a layby. The nearest one was about two kilometres further on up the hill where a parking place is marked on the OS map. Grrr....... still it was closer than Bridge of Orchy. However, to my delight he pulled the coach off the road at the exit of some forestry roads just beyond the bridge. It was obvious that the water level in Loch Tulla was very low and, indeed, everywhere on my walks this week was surprisingly dry. 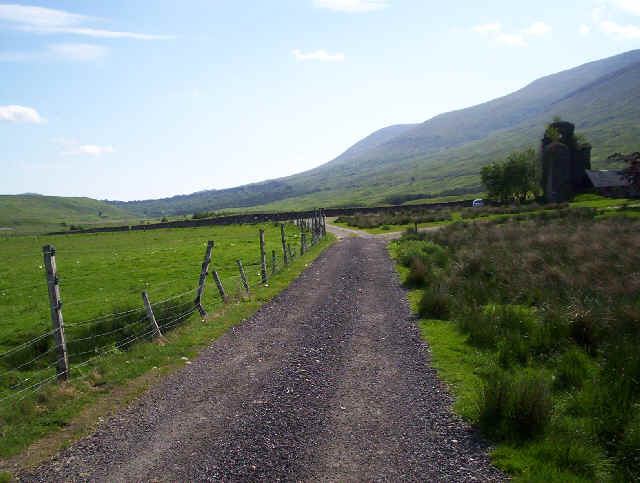 A quick walk of less than a kilometre along the A82 found me on the track to Achallader farm. 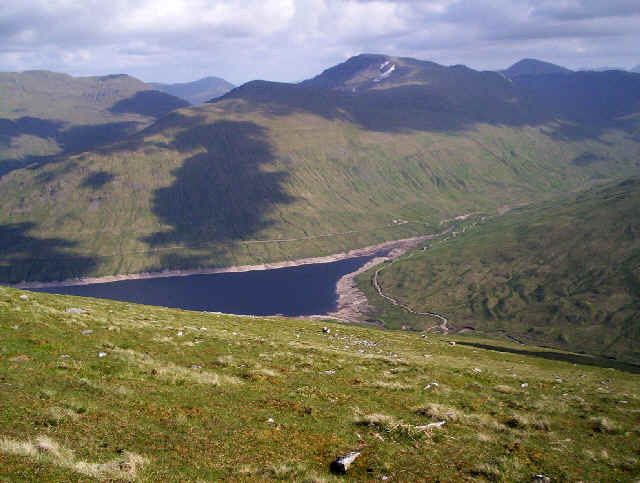 Here is a view of the first two hills to be climbed Beinn a' Chreachain on the left and Beinn Achaladair on the right as seen from the main road near Loch Tulla. I left the main road at 9.10. 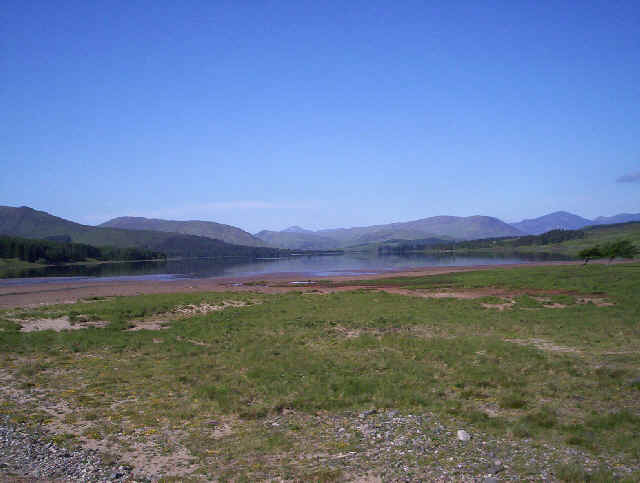 The beach at the end of Loch Tulla shows how low the water in the loch was. A brisk twenty minute walk from the coach found me at Achallader farm with the old tower visible on the right. The car park here is where most people start walking from. Looking back the northern fsce of Beinn a'Dothaidh and the bealach at the head of Coire Achaladair dominate the scene. 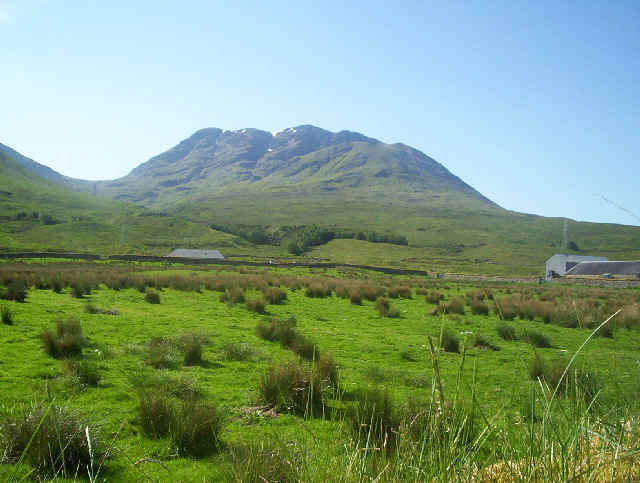 In just over six hours I'll be at the bealach. The walk along the Water of Tulla is a delight. Initially, the track follows the south bank but soon crosses over to the north bank. 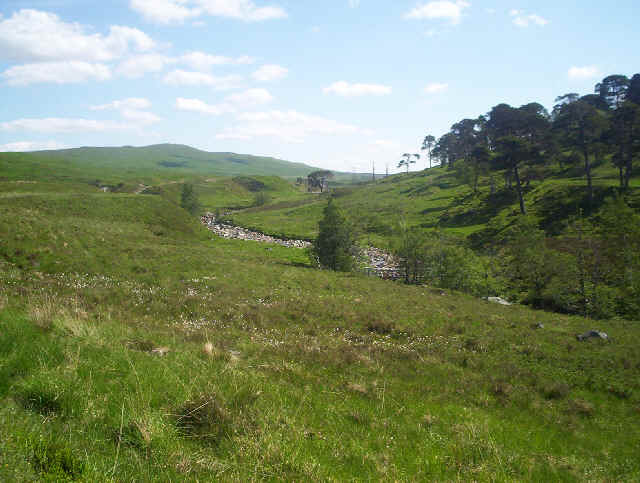 The remnants of the Caledonian forest stretch along the river here. An hour after leaving the farm I reached the small footbridge over the river at NN35340 46798. You can just see it with the stoney bed of the river above it in the centre of the photo. Beyond stretches the beginning of Rannoch Moor. Navigation beyond the stream was a bit hit and miss as the path is not very distinct. It's important to reach the gap between two deer fences at NN35756 46820 and then the railway underpass at NN35884 46669. You'll have to stoop to get under the bridge as it's less than 5 feet high. 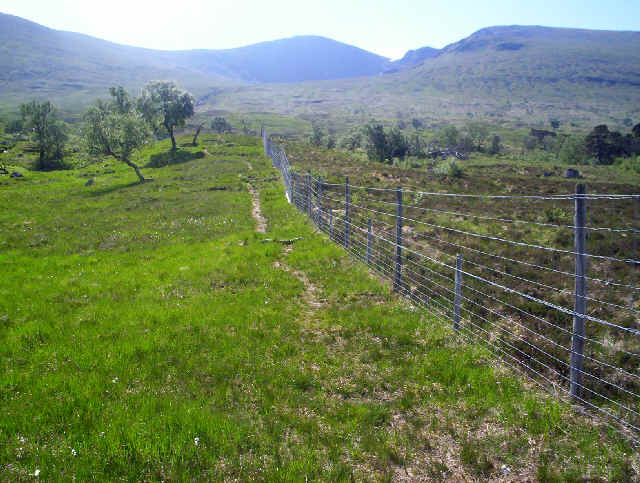 Beyond the railway this deer fence is followed until you reach the Allt Coire an Lochain stream. The path remains clear as the rock staircase of the stream bed is followed until the stream bends to head into the corrie. 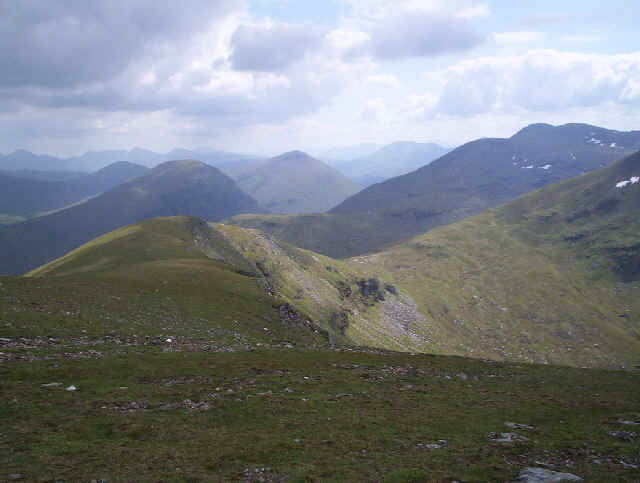 ....the view backwards towards the Black Mount, Glen Coe and Rannoch Moor. After being trackless for most of the climb a faint path appears just before the ridge is reached and the really hard work is over. The summit is in view! 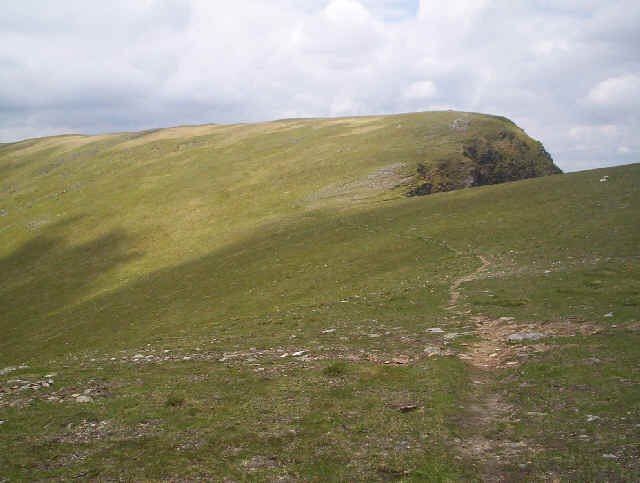 A delightful path leads onwards to the summit cairn. There's lots of snow left in early June 2008. This has to be one of my favourite mountain views. 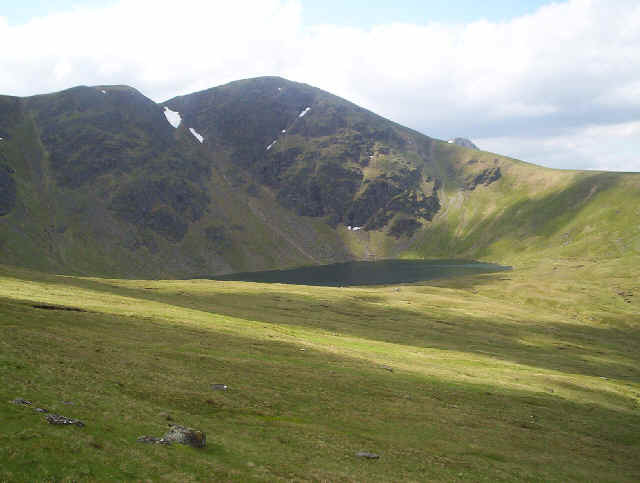 Coire an Lochain with Lochan a'Chreachain reflecting the sky nearly 400m below. 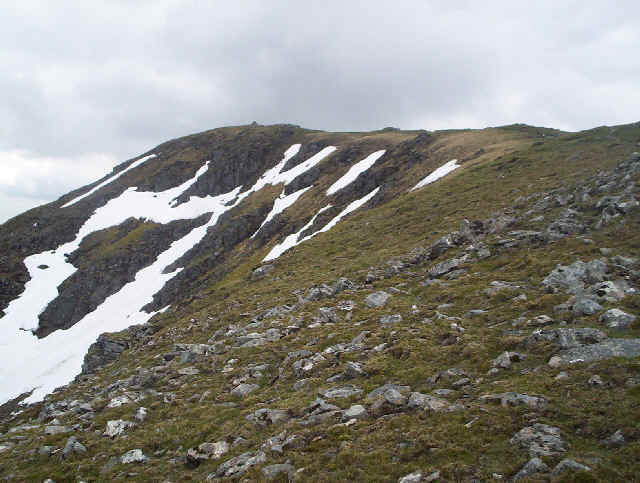 Another view of the summit shows the large amount of snow still present. 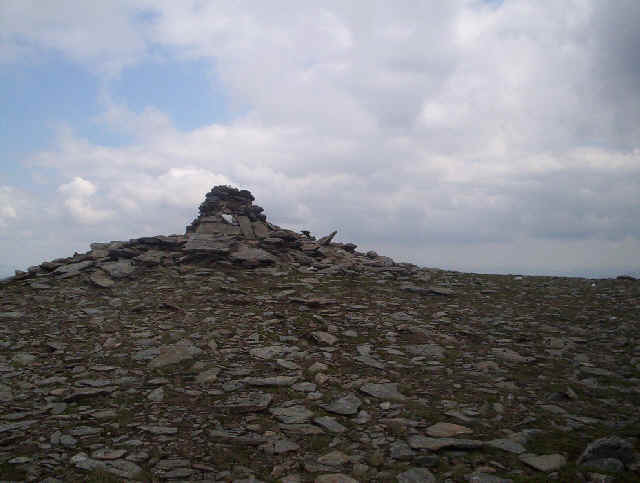 The summit cairn of Beinn a'Chreachain was reached 3hours 30 minutes after leaving the farm. It's taken 20 minutes longer than the times in the SMC Munro book but I'm pleased given the time i waste stopping to take photos and loosing my way in the woods. After a twenty minute lunch break, soaking in the views and the silence, I set off down hill towards the flattish ridge of Meall Buidhe. There's a clear path once off the stones although I was soon led astray. 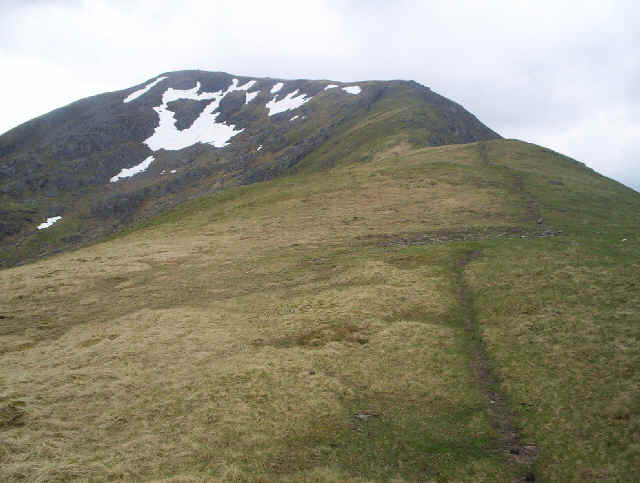 From near the cliffs there is another track which appears to skirt Meall Buidhe's summit on its south-eastern flanks. 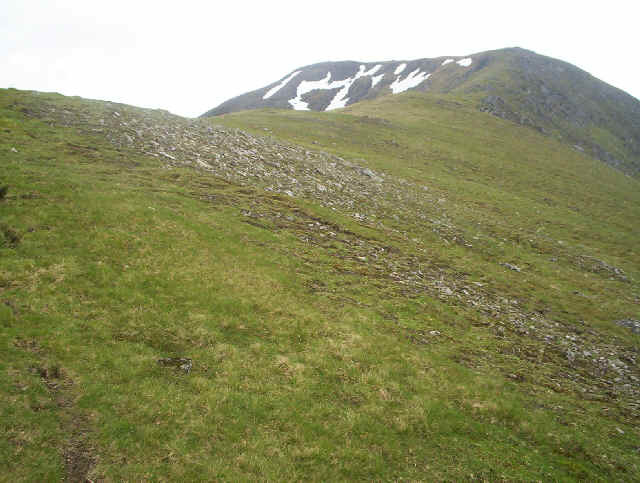 I took this, presuming that it would lead me towards the col between Meall Buidhe and Beinn Achaladair. 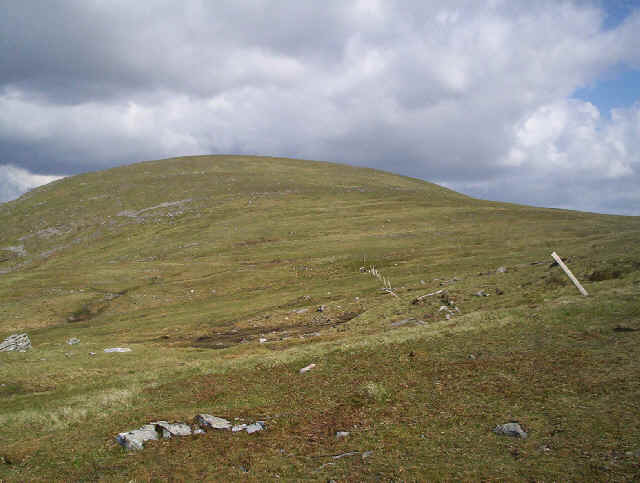 However, I soon realised that it wasn't heading in the correct direction and appeared to be heading down hill so I climbed back up to the main ridge of Meall Buidhe. 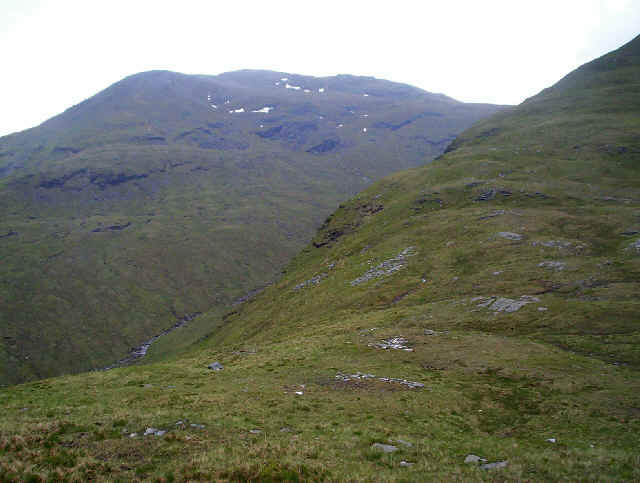 Here I met another walker who was walking all five of the hills near Bridge of Orchy; what a superman! Of course this meant another 10 minutes on the walking time between Beinn a'Chreachain and Beinn Achaladair; time I couldn't really afford to waste on a long day. However, I find it impossible to ignore another person in such an isolated spot and we spent an enjoyable few minutes chatting about the hills. So is you're from Brighton and you were here on Wednesday 4th June 2008 I hoped you completed the round. 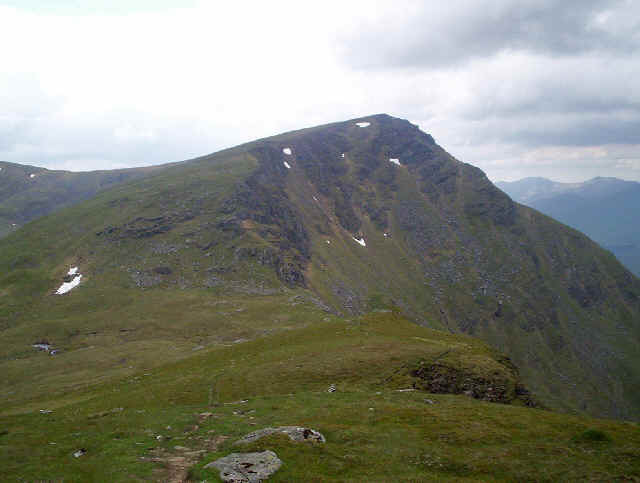 The rather undistinguished top of Meall Buidhe with the next goal of Beinn Achaladair beyond. To reach the summit there's a steep track that clambers up the nose of the hill twisting and turning and requiring the odd use of hands. 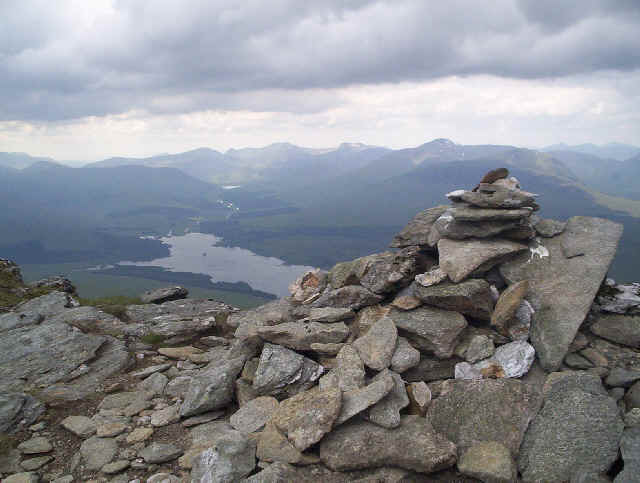 It's somewhat more exhilarating than climbing Beinn a'Chreachain! 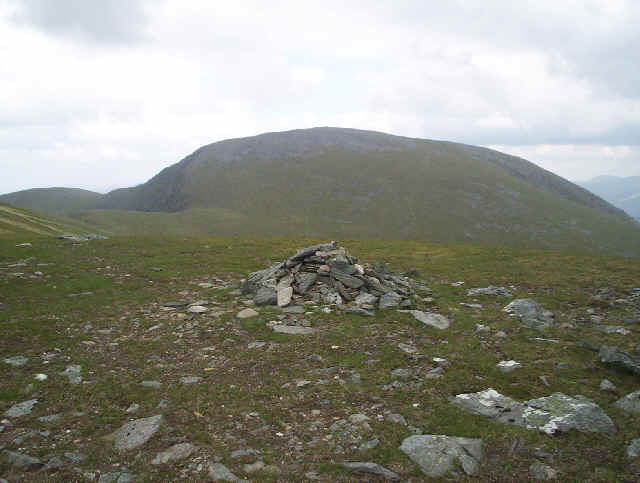 The summit cairn of Beinn Achaladair stands on the top of its cliffs and has a dramatically exposed feel to iton the north western side. 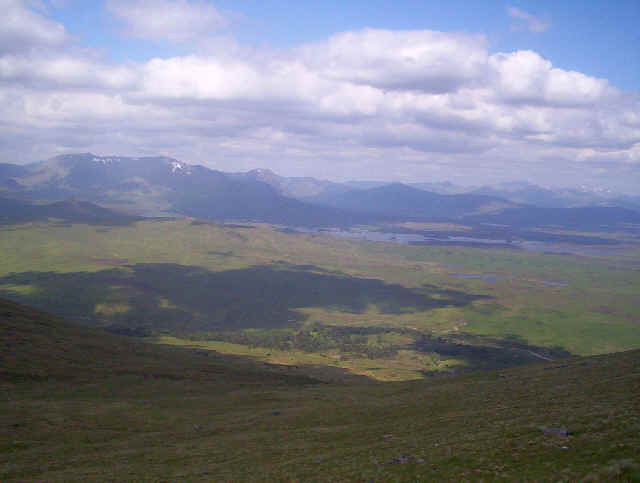 Below can be seen Loch Tulla. 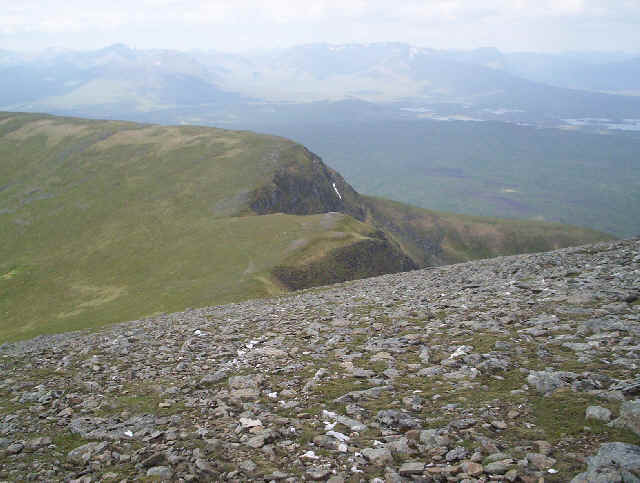 It had taken me 1 hour and 25 minutes from Beinn a' Chreachain, compared to the expected one hour in the SMC book. I was beginning to wonder if going onto the third hill was going to be possible. 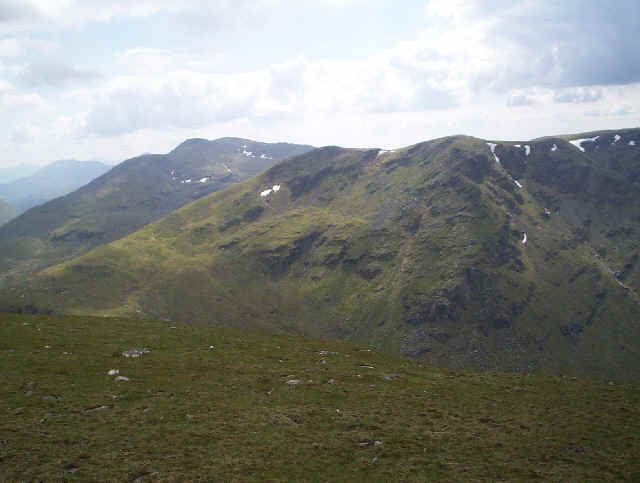 Good progress was made downhill and soon both Beinn Dorain (on the right) and Beinn an Dothaidh were close. 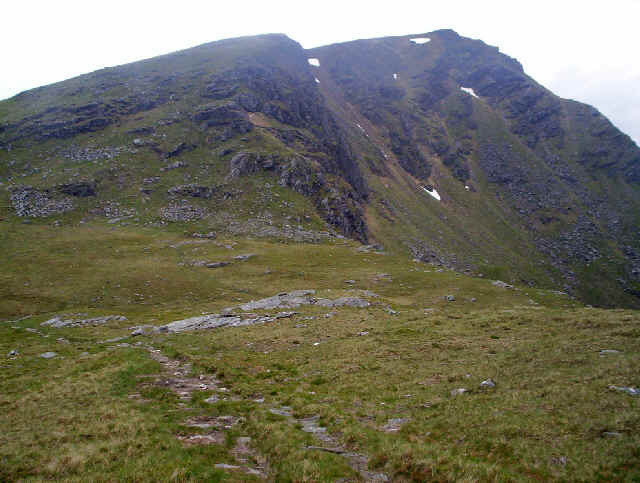 The faint track heads down hill towards the bealach at Coire Daingean. 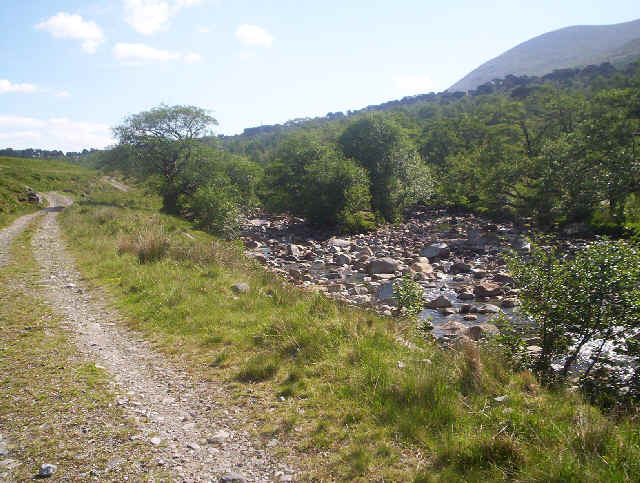 Head back to Achalader farm, with a long road walk back to Bridge of Orchy along the A82. 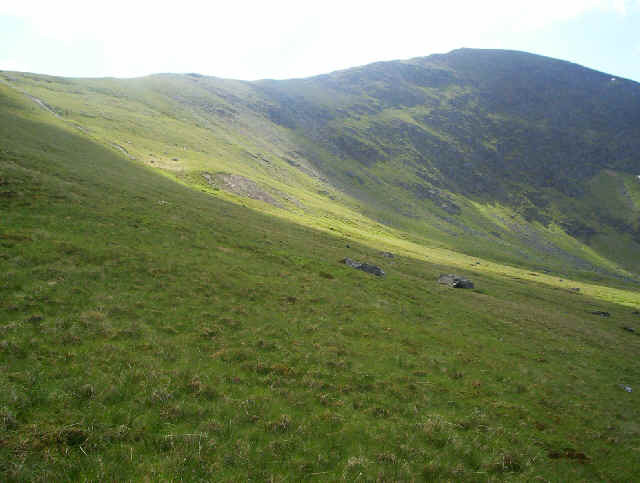 Descend into Gleann Calliche. 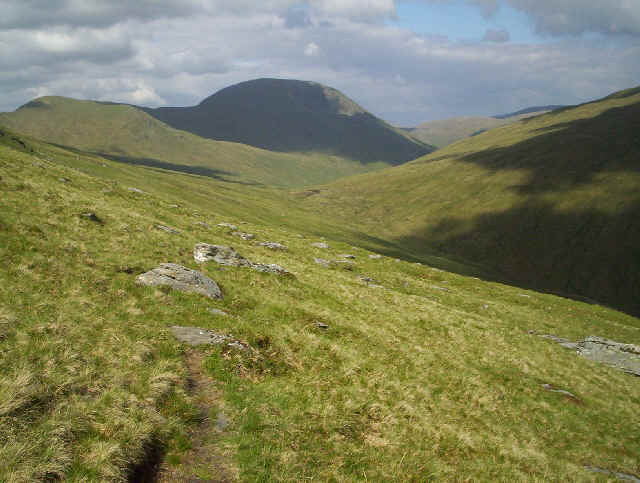 Here I could either join the broad track that runs along the Auch Gleann and back to Tyndrum along the West Highland Way or, if time permitted, I could still climb Beinn Mhanach. Needless to say option 2 won. So it was off down the left hand side of the bealach. 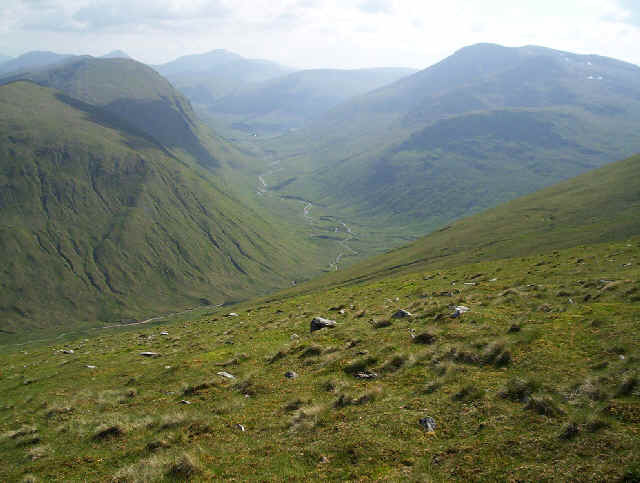 The decision was made easy by the presence of a good stalkers' path which starts at the bealach and heads gently down the slopes of Beinn Achaladair towards the watershed between the Gleann Cailliche and the Auch Gleann. In the photo this is the low point in the centre of the photo. It's about at about 610 m and is conveniently marked by a row of old fence posts. The col here is rather peaty and in normal Scottish weather probably rather boggy but with the dry weather easily crossed. 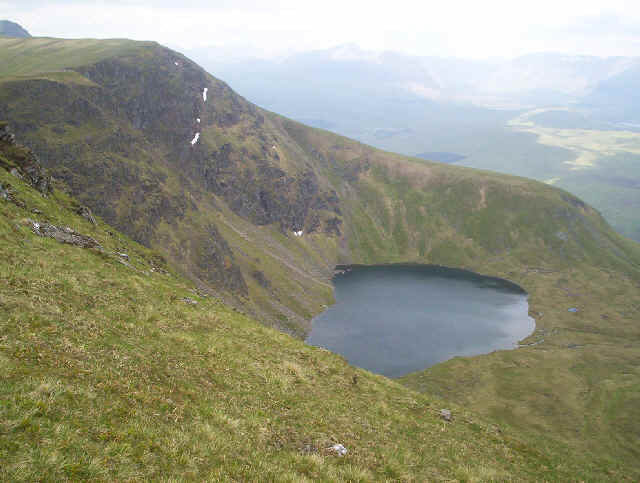 I still wasn't certain that I had time to climb Beinn Mhanach and walk back to Tyndrum in time for a meal but this is where my GPS really came into its own. 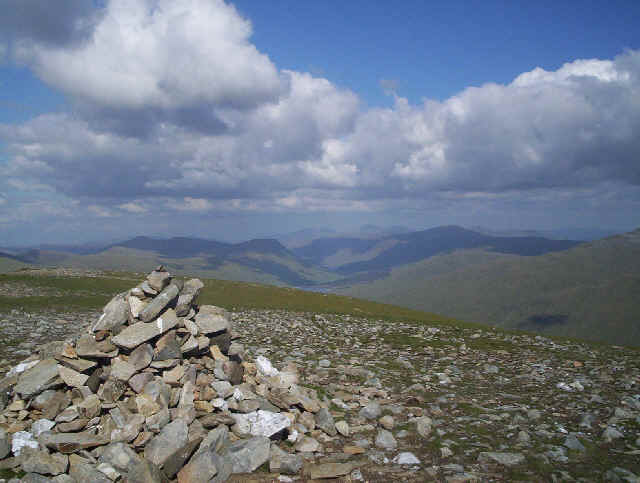 I had the coordinates of Beinn Mhanach in the GPS and simply set the display to display the expected arrival time. I set off following the fence posts at my usual slow but steady pace and within a minute or so the GPS suggested and arrival time of 17.05. 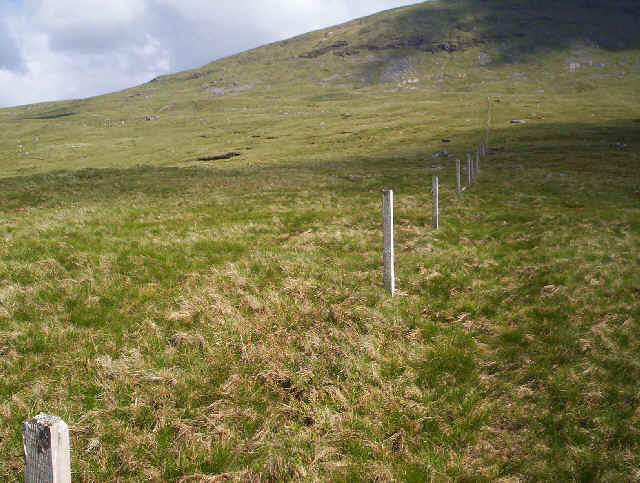 The fence posts head straight up hill at first towards Beinn a'Chuirn and then turn eastwards towards Beinn Mhanach. Near the summit the posts change direction again but by this stage the goal is in view and sure enough I arrived at the summit at 17.05. I allowed myself the luxury of a quarter of an hour to eat the "Green Welly Shops" sandwiches and a banana before heading down hill towards the, now extended, vehicle track that runs along Loch Lyon and down the Auch Gleann. It's a steep slope and at the end of a long day felt interminable. Rather than take what might be the most obvious route diagonally down the slope I headed towards an unnamed stream at about NN368 405 and followed this down to the summit of the road. The head of Loch Lyon reflects the blue sky of a lovely summer's evening. Even though I was feeling a littl weary I couldn't think of a better place to be. For years I've wanted to walk in this glen. I'd read that crossing the stream could be a problem with so many fords but this evening I could almost have walked through the river without using the steeping stones. 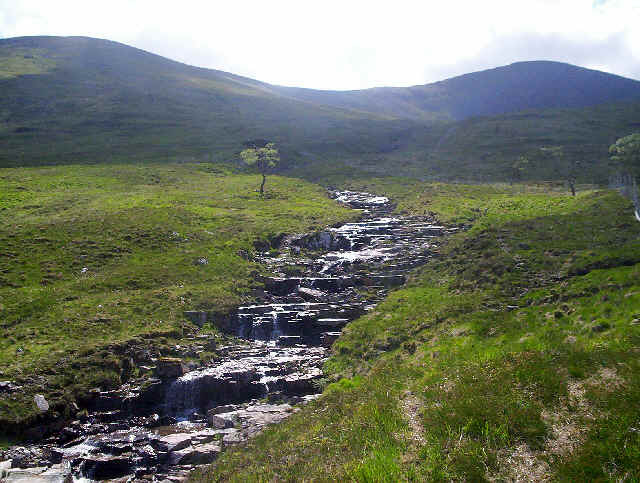 An hour after leaving the summit I was heading back to Tyndrum. 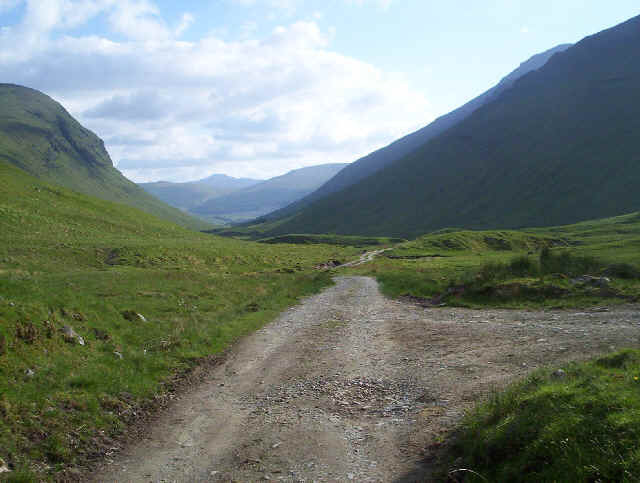 The walk down to the West Highland Way took exactly one and a half hours. Again I found using the GPS's arrival time prediction a real moral booster, especially when I noticed I was still managing to average 6.2 km/h after over ten hours of walking. 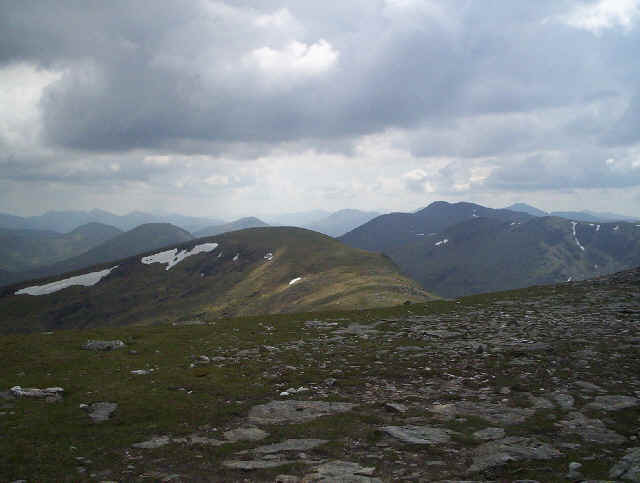 A last look back at Beinn a'Chuirn and Beinn Mhanach (on the left). 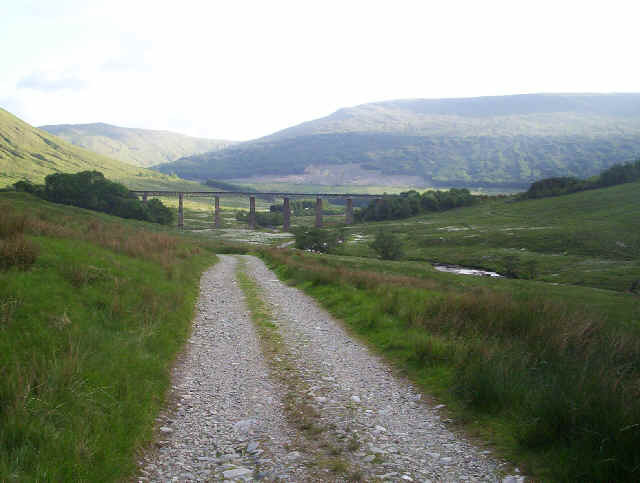 At last the West Highland Railway viaduct is in sight. 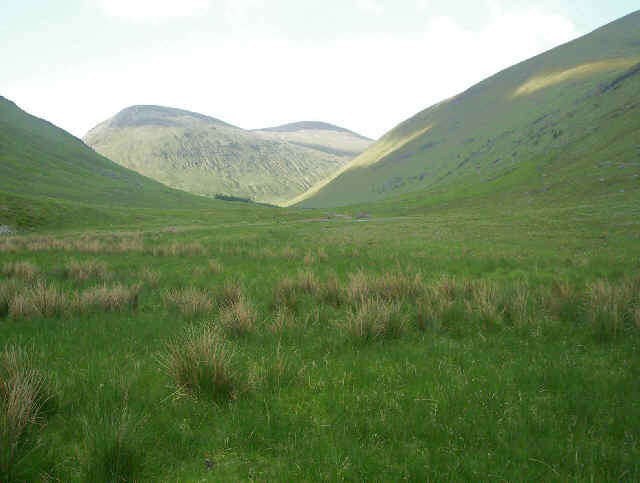 It was half past seven and I'd still over an hour's walk back to Tyndrum. 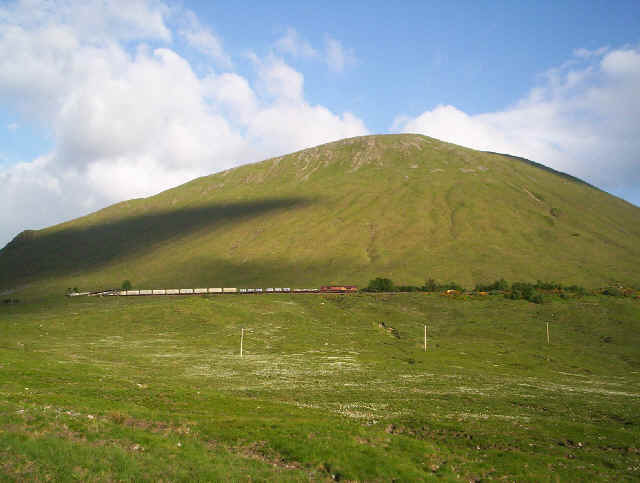 As a railway enthusiast I couldn't resist putting this photo in the report. The evening freight train growls up to the county March summit near Auch, conveying empty alumina tanks and aluminium ingots from the British Alcan factory at Fort William. 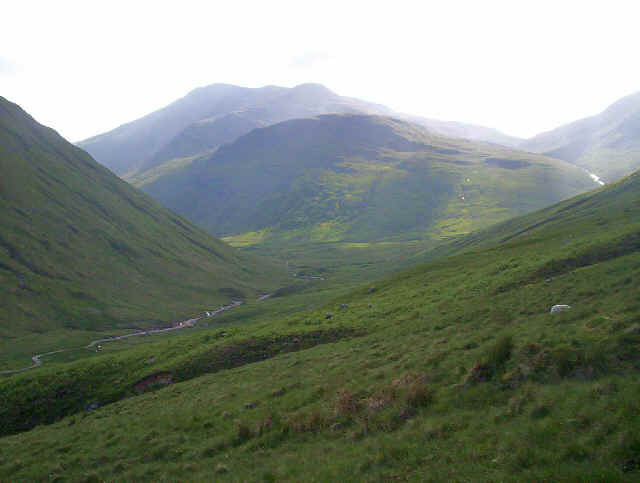 From here it was a yomp along the West Highland Way back to Tyndrum which I reached at 21.00. At twelve hours and about 22 miles it's the longest walk I've ever done, but also one of the most satisfying; all the Bridge of Orchy hills conquered as well! !